- Wave Masters '09 drew quite the crowd. Various age groups participated with their own unique play styles and tactics. One participant was disqualified due to cheating. - A kiosk was set up were participants could download "Crimson Meteor", an exclusive Giga Card. The lines were surprisingly long, stretching all the way back into Capcom's Monster Hunter booth. - The winners of the Junior, Senior, and "Kaizou" classes received SSR3 themed wall scrolls, free Noise Gear Cards and exclusive "Crown Data." - The game's conception was a response to those who wanted more out of the EXE series. It is being touted as a "Data Action RPG." - S.S.R is also under the assumption that it is a "remake." His reasoning is somewhat confusing, more so when read through a computer translation. 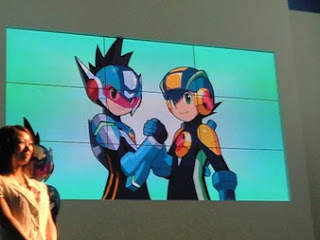 - Horinouchi plans to celebrate the coming of Rockman's 25th anniversary with a bunch of "new projects." No specifics yet, it's all just a bunch of ideas. Operate Shooting Star is just the beginning of what's to come. - Capcom will open a OSS teaser website in the near future. I've been checking Capcom JP's site every day for a teaser to appear. I hope it's soon. I'm getting a little too worked up over this I guess, but it's pretty exciting! I do hope it's a new title and not a remake, though. I don't want the EXE series' story retconned by Geo/Omega Xis' appearance in earlier chapters. I doubt it is a remake..... I hope to GOD it isn't a remake, and I am really looking forward to it. I wonder when that RMEXE: OSS site will be up, I really hope they have more than just a teaser image and a small bit of text. Please please do not use the dreaded online translator. They stink, especially with Japanese. It's much different than English. I'll translate some of the important things if you need to. So all our whining about EXE ending paid off? Wow. proto, what is crown data? An in-game item, kinda like a medal. ah right, cool, does it have any in game effects? Nah, it's just there for show. If it will be a remake then that means battles would be in 3D. I think they won't pick either of the two battlefields. Take the BN5 field in 3D. Honestly, which angle would be the most practical to play on? I think something new will come out. @Mega Rock.exe: I like the top left one. I would LOVE it if this game had that view. But the edges would be so pointy. The gameplay wouldn't feel the same even though the movement is the same. Well not exactly that view. But an overhead one. Same as in the 2D games.